The group is a registered charity and depends on public support to continue. The Isle of Wight group are lucky to have a dedicated committee to steer everything in the right direction. They are also the backbone of the 'gang', prepared to give up Wednesday mornings throughout the spring/summer/autumn to ensure that the driving days are a success. Added to this, there is the team who deal with the pit stops. These are dedicated folk who ensure people can get into and out of the carriages comfortably and safely. Everyone fits in with setting up our group so they can enjoy a sandwich and a cuppa in comfort between drives. Also there are those athletic types who cycle behind the carriage when they go for a longer drive. (Safety requirement). See Volunteer. Members all help with coffee mornings and socials - even writing a quiz for the end of season lunch. If you think you could offer the group any support by 'mucking in' then please contact a committee member. Donations - If you would like to donate to the RDA then please contact any member of the IOW RDA Committee. Every donation, even small change dropped into one of our collecting tins, is used directly to help deserving people enjoy the group activities. Consider making a bequest in your will? If you can fund raise in any other way, again contact one of the committee to obtain their support. We hope to hold many fundraising events in the future. In the planning stage, a dog show, quiz evenings, coffee mornings and race evenings. Any other ideas please? If you would like to see for yourself how the group work, join the group as a helper or disabled driver - just ask. You will be made most welcome at one of our driving days. The most difficult support to obtain, particularly due to our Island location, is suitable horses/ponies. All animals have to be tested by the RDA to be 'bomb proof'. We are very lucky with the owners and horses we have to use at the moment but would always welcome more. 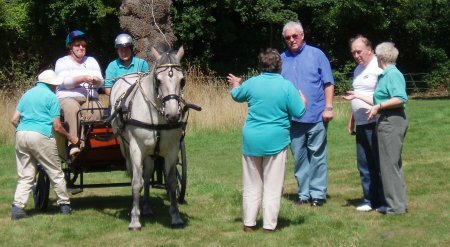 If you have a suitable horse or pony, broken to harness, then please contact any member of the committee. They can discuss with you what needs to be done and arrange for your animal to be "tested" by the RDA. CLICK HERE TO FIND MORE INFORMATION ON BECOMING A VOLUNTEER WITH THE RDA.